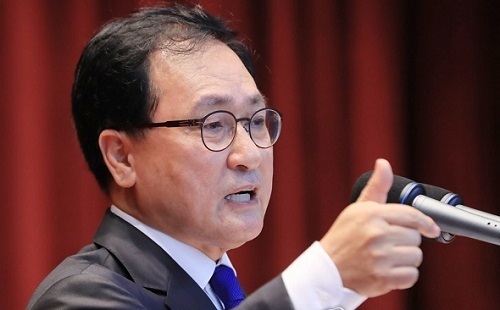 South Korea's new chief ICT policymaker made a visit to the state-run science laboratory on Tuesday, stressing that both the government and researchers should push forward reform to face various challenges under the fourth industrial revolution. You Young-min, who took office earlier this month, made his first official visit to the Korea Institute of Science and Technology located in northern Seoul. "I will make visits as much as possible to communicate more with field researchers," Yoo said during his talks with KIST researchers. Yoo vowed to work closely with the scientists and listen to their opinions to effectively allocate the budget for research and development in the science and technology field amid the challenges. The government has been engaged in various projects to cope with the latest industrial paradigm shift that is characterized by a fusion of cutting-edge technologies, such as big data and the Internet of Things (IoT).